In a recent clear-out of my study I came across a Syria Today magazine with the cover feature “Unlocking Civil Society”, 15 pages of in-depth coverage of how civil society inside Syria could move forward. It was dated March 2010. Re-reading the feature now, after three years of devastating conflict, is especially poignant. I was in Damascus during March 2011 when the first peaceful demonstrations took place. On 15 March I even tried to find them, but they were over so quickly I could not get there in time. The atmosphere inside the city was tense and the regime was very edgy, all too aware of what had just happened in Tunisia and in Egypt. Police and security officials were under instruction be to nicer to members of the public, not to do anything that might provoke a reaction. For a brief and wonderful interlude, drivers were waved on at red traffic lights, and government offices became places of politeness, joviality even. Three days later, the instruction was broken. The over-zealous governor of Dera’a ordered troops to fire on a crowd of protesters whose children had been arrested for drawing graffiti, resulting in the first deaths of the revolution. The die was cast, and as protests quickly escalated all over the country in the following weeks, the government response switched to its default setting – violence. The scale of what has happened since defies credulity – at least 140,000 dead, untold thousands injured, missing or imprisoned, 6.5 million internally displaced and 2.5 million forced to flee as refugees to neighbouring countries. Where is it all heading? Every Syrian I have ever spoken to about what they want for the future of the country has always said the same thing, namely, that top levels in government, the police, the armed forces and the security services should leave the country, that the rest should stay, and that a transitional temporary government should be put in place till new elections. Thereafter the priority would have to be reconciliation. Those without blood on their hands would have to be forgiven and re-assimilated. Most Syrian people are proud of the diversity of their society and want to preserve it. Its loss makes them value it all the more and they want it restored as soon as possible. Syrians have a very distinctive character, even the poorest ones. They have a natural sense of dignity and identity, a strong sense of self. 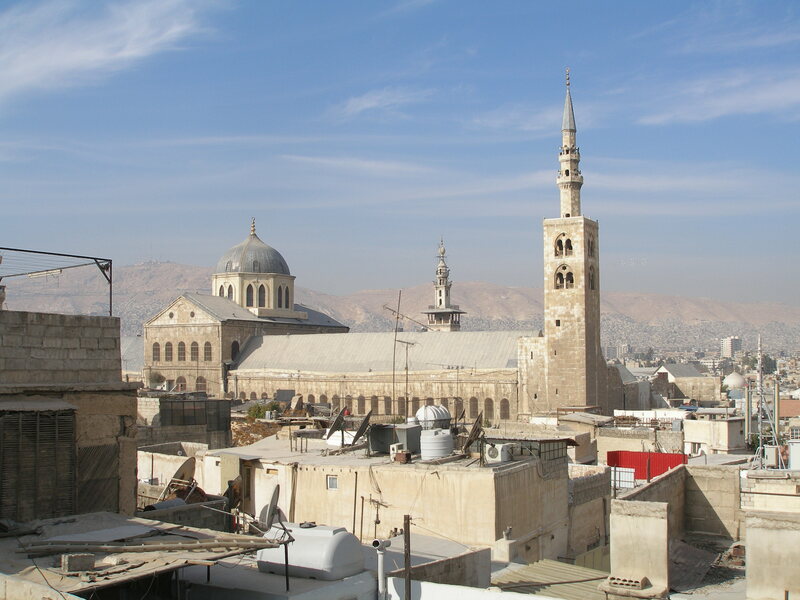 It must somehow be the legacy of their deep and rich Syrian history, absorbing the complexities of many cultures that have ruled the region over the centuries. The timing of the country’s descent into war was particularly ironic in Damascus: the new EU-funded Modernisation of Administration Management (MAM) project had just come to fruition with a series of themed walks round historic Damascus; the new basalt paving in all the neighbourhoods of the Old City around Straight Street had just been completed; and Al-Jaza’iri’s famous 19th century house on the Barada River just north of the Old City had just been restored and was serving as a museum and regional centre for sustainable development. The last time I was inside Syria in April 2012, Christian and Muslim friends alike agreed that the Ba’ath Party had destroyed the country. For over 40 years they destroyed the education system, with a kind of brainwashing of the young in state schools, a Bashar cult, making all children worship, obey and love him. Both Hafez al-Assad and his son Bashar settled their fellow Alawis in the mountainous parts of Damascus like Mezzeh 86 close to the Presidential Palace. After the 2006 war in Lebanon between Israel and Hizbullah, Bashar was very influenced by and impressed by Hassan Nasrallah because of their success in bloodying Israel’s nose. He became closer to Iran and the Shi’a at that time. Lots of Sunnis were actually paid to become Shi’a, given salaries. The last voting farce inside Syria was the February 2012 ‘referendum on the constitution’. Syrian friends living in the city told me no one went out to vote except those who had their IDs taken away at checkpoints and were therefore forced to go and vote in order to get them back again. Government employees were obliged to vote of course, but most ordinary people stayed at home and were very angry at the way the Syrian state TV then showed people queuing at voting booths, presenting it so misleadingly, as if 86% of people really went out. It made even the doubters realise what this regime would do to stay in power. In Damascus the streets in the Old City and elsewhere were full of banners for candidates, men in their 30s, 40s and 50s, with slogans below reading something like: ‘Your independent candidate for Damascus’. It was ridiculous and fooled no one. Not one of the men was ‘independent’ All were regime-sanctioned. By these rules all external opposition figures are rendered ineligible. Given that the ‘international community’ cannot agree on anything about Syria except that the statistics are terrible, Syrians are on their own. No one is coming to their rescue. The rich have mainly left to start new lives abroad. Those that are left behind will need to work overtime if Syrian civil society is ever to free itself from the 43-year stranglehold of Assad rule. Syria deserves to be rescued and needs all the help it can get. It will be a long struggle but I am certain it will eventually succeed.